CHICAGO — Scott Frost talks to Tom Osborne almost every week. He welcomes his college coach into his office at Nebraska, or they go turkey hunting or fishing. Hard at work at rebuilding his storied alma mater, Frost is keeping his friends as close as possible. The 43-year-old Frost is home again after a successful run with Central Florida, returning to Lincoln in December after coaching the Knights to a 13-0 record last season. The long-term objective is moving Nebraska back into the upper echelon of college football, and the plan is a familiar one. 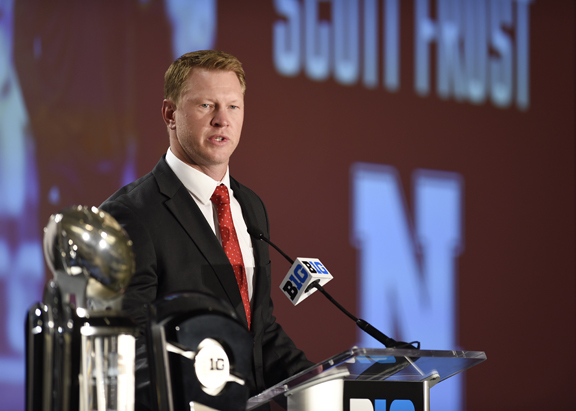 “Coach Osborne had the formula that Nebraska figured out,” Frost said. Frost grew up about 90 minutes west of Nebraska’s campus and led the 1997 Cornhuskers to a share of the national championship in Osborne’s final year as coach. It’s a familiar script for the Big Ten after Jim Harbaugh took over at Michigan in December 2014. Harbaugh also played quarterback in college and returned to his alma mater with much fanfare and excitement. He coached against Frost in 2016, directing the Wolverines to a 51-14 victory over UCF in Ann Arbor. “He brought a really motivated, excellent football team up there,” Harbaugh said. Harbaugh himself is beginning an intriguing year after Michigan went 8-5 last season, dropping its last three games.